Roadwork continued on Doubleday Avenue along Oak Ridge today. Besides digging up the earth for a new drainage ditch, there weren’t too many problems with today’s work. 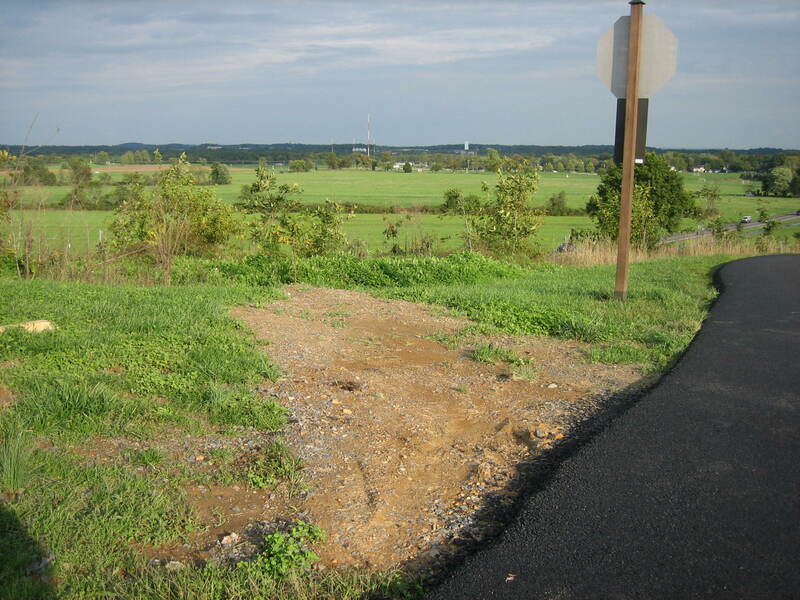 This view was taken from the northeast facing southwest at approximately 5:00 PM on Wednesday, October 1, 2008. Road construction continued on Doubleday Avenue today, but it appeared that the contractors’ hearts weren’t really into it. Sure there was the usual scarring of the land as new drainage areas were constructed, and the plastic pipes sticking out of the dirt haven’t lost their allure, but something was different. They just weren’t spreading the asphalt as deep and wide as they have in other areas. We couldn’t find a single witness boulder, witness tree, or flank marker touched by asphalt. Also, the pavement here wasn’t as thick as it usually is. Sometimes it would reach eight or nine inches in height, but for great lengths it was six inches or less. We know that with a little extra effort, they can get back to their foot high shoulders and four foot wide ditches. Wimps. 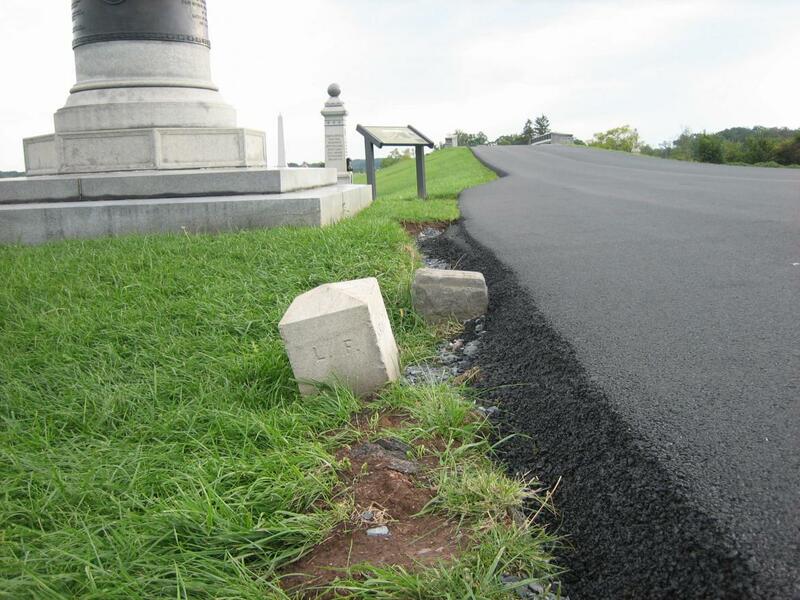 See our post on Asphalt Touches a Flank Marker on September 30, 2008. See our post on the Robinson Avenue “Toboggan Run” on September 29, 2008. 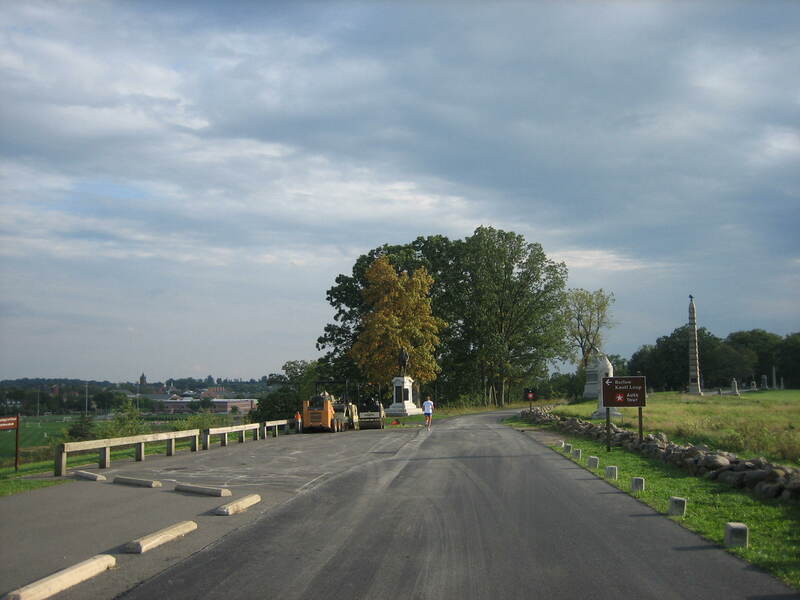 See our post titled “Devils Den: Aftermath of the ‘Construction’” on September 11, 2008. 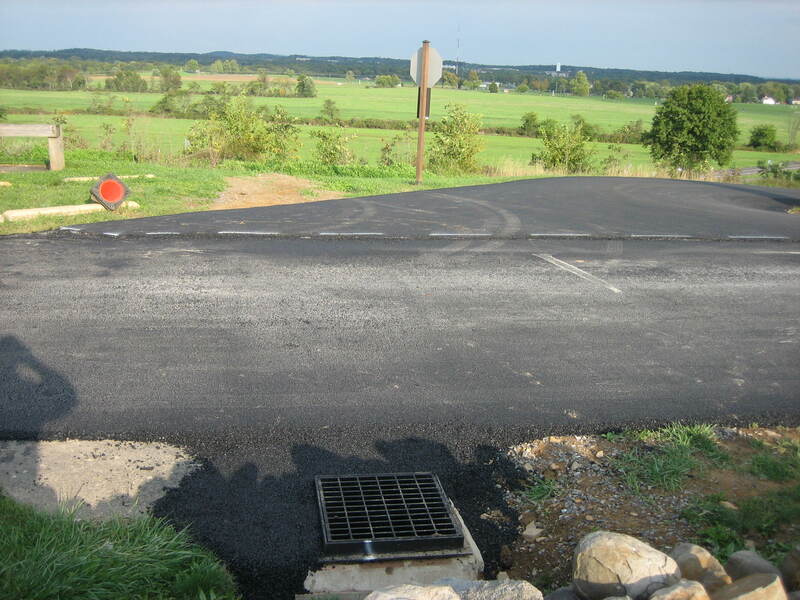 See our post titled “Slathering the Loop With Asphalt” on September 13, 2008. 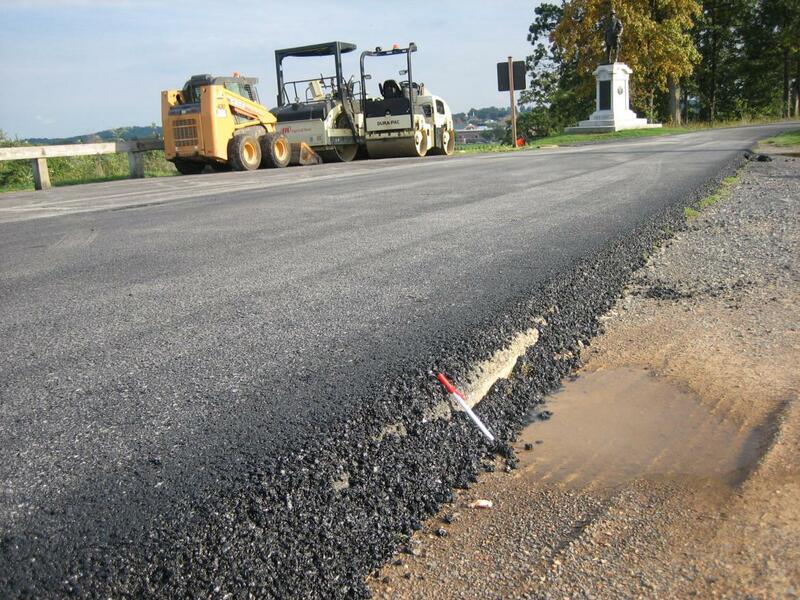 See our post titled “Asphalt: A Journey in Time” on September 22, 2008. See our post on the dueling detour signs on August 18, 2008. 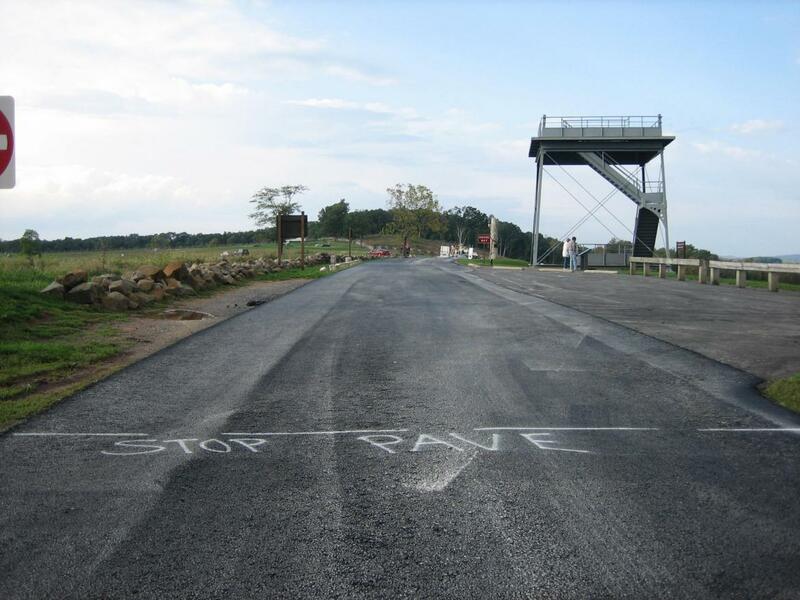 See our post on Crawford Avenue Construction and poor detour signs on August 6, 2008. Doubleday was closed today from the Mummasburg Road (running from top left to bottom right) to Buford Avenue on McPherson’s Ridge. 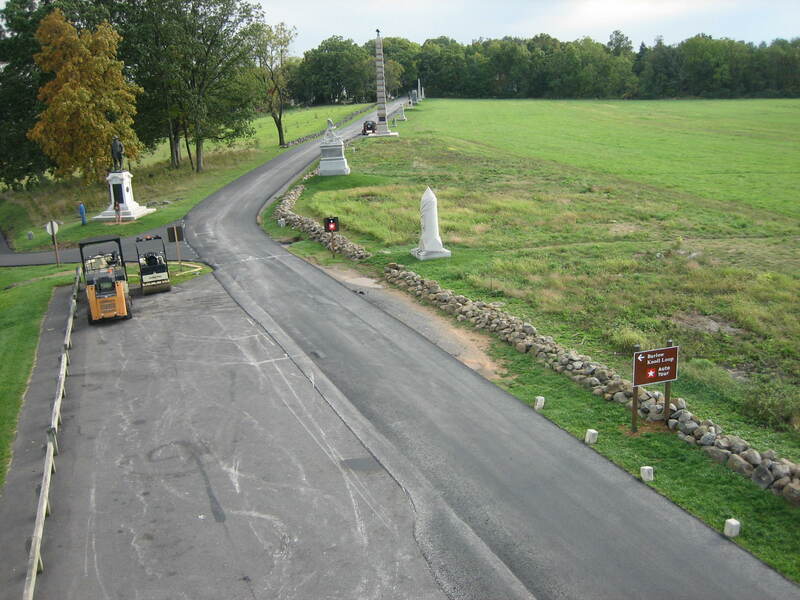 The monument to the 90th Pennsylvania Infantry is on the right (east) side of Doubleday Avenue, and the Eternal Light Peace Memorial (Peace Light) is in the background on Oak Hill. This view was taken from the southeast facing northwest at approximately 5:00 PM on Wednesday, October 1, 2008. At ground level, looking back to Oak Hill and the Mummasburg Road. No those aren’t flank markers that the asphalt is almost touching on the left (west) side of the road. 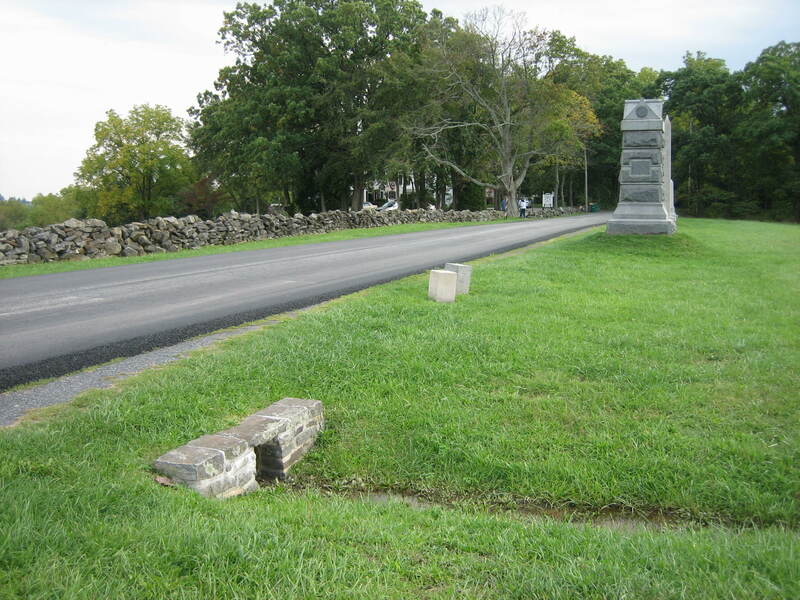 Those are concrete barriers to keep visitors from parking off the road or contractors from paving the 90th Pennsylvania left flank marker. This view was taken from the south facing north at approximately 5:00 PM on Wednesday, October 1, 2008. 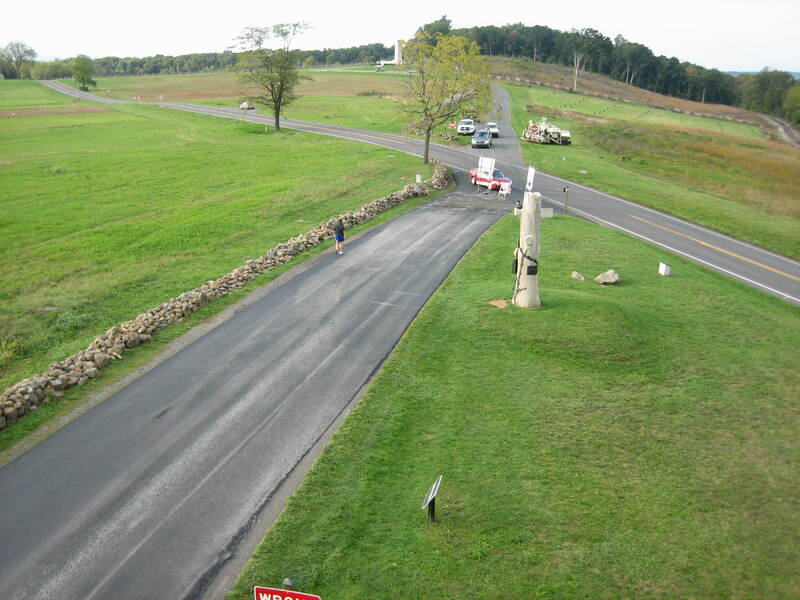 We are looking south along Doubleday Avenue, and the Park Service has installed a new sign on the right… This view was taken from the north facing south at approximately 5:00 PM on Wednesday, October 1, 2008. This sign appears to show the auto tour going to the east to Barlow Knoll. The next sign shows the auto tour going straight down Doubleday Avenue. 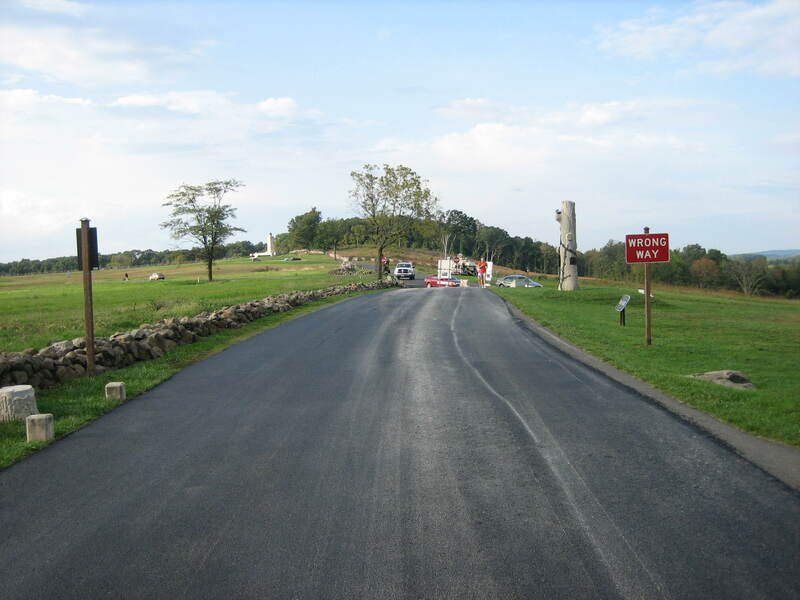 We know what they mean, but if you were a visitor to Gettysburg for the first time, would you follow the arrow on the big sign (which we know to be a three hour tour) or the small sign (which we know to be a two hour tour)? This view was taken from the north facing south at approximately 5:00 PM on Wednesday, October 1, 2008. Here the asphalt is a measly six inches off the ground. This view was taken from the northwest facing southeast at approximately 5:00 PM on Wednesday, October 1, 2008. 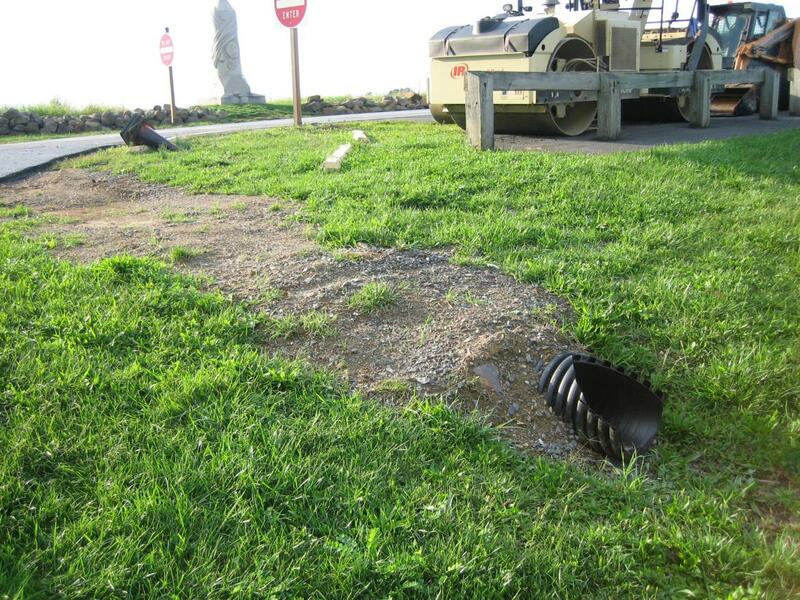 Installing new drains gives the contractors (or more properly, whoever drew up the contract for this project) an opportunity to tear up the battlefield. This view was taken from the north facing south at approximately 5:00 PM on Wednesday, October 1, 2008. 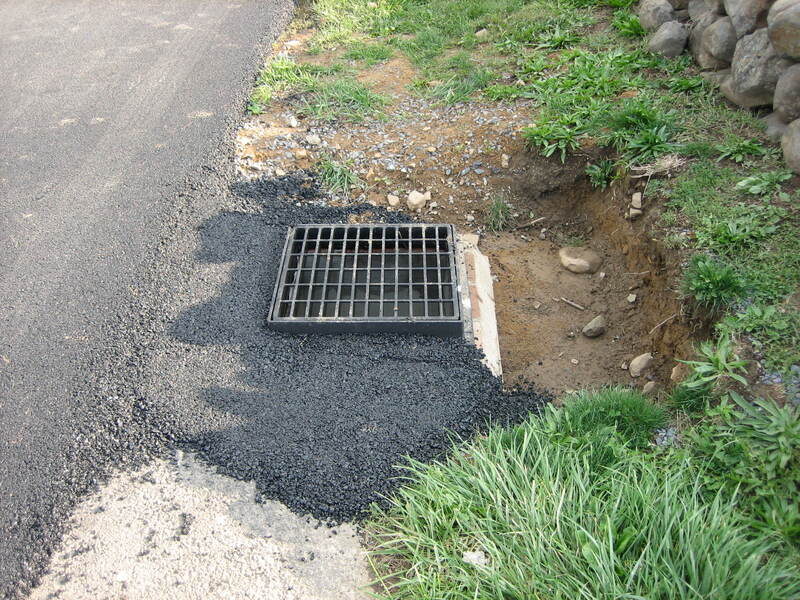 The drainage pipe runs from the drain on the west side of Doubleday Avenue to the east side of Doubleday Avenue and Oak Ridge. Robinson Avenue is on the right. This view was taken from the west facing east at approximately 5:00 PM on Wednesday, October 1, 2008. Here’s a five foot wide swath that was dug up on the historic battlefield. This view was taken from the west facing east at approximately 5:00 PM on Wednesday, October 1, 2008. Coming out on the other side is this black plastic pipe. This view was taken from the southeast facing northwest at approximately 5:00 PM on Wednesday, October 1, 2008. 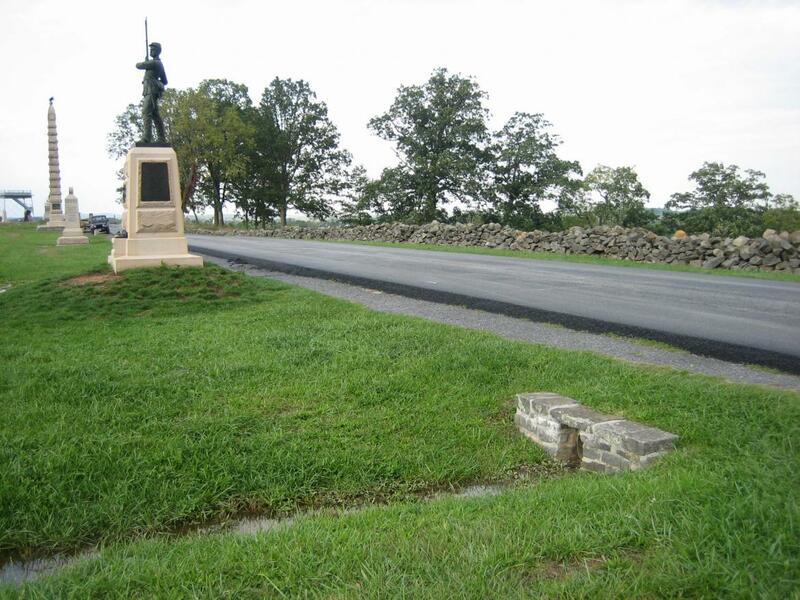 They didn’t have to go far to see the way drainage areas used to be constructed on the battlefield. This view was taken from the west facing east at approximately 5:00 PM on Wednesday, October 1, 2008. 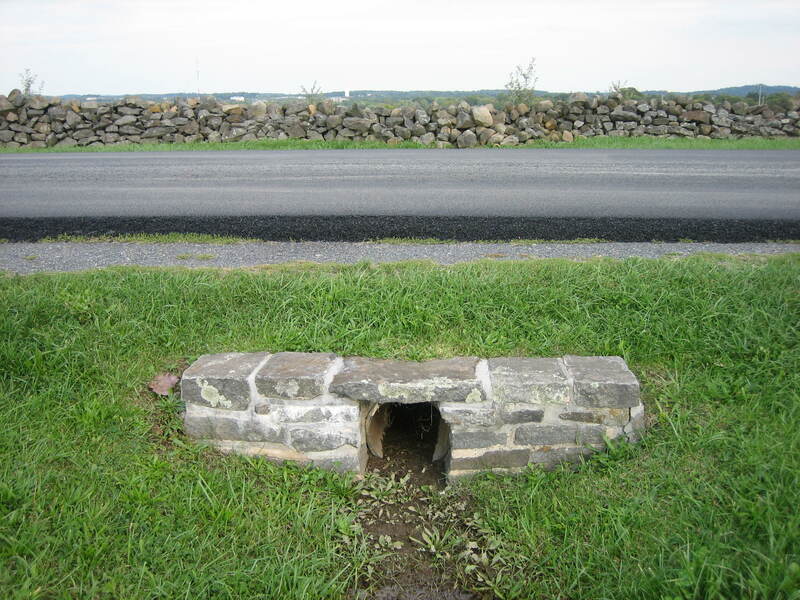 This drain is between the 11th Pennsylvania monument on the left (north)… This view was taken from the southwest facing northeast at approximately 5:00 PM on Wednesday, October 1, 2008. And the 107th Pennsylvania on the right (south). This view was taken from the northwest facing southeast at approximately 5:00 PM on Wednesday, October 1, 2008. Here is an instruction with which we agree. This view was taken from the south facing north at approximately 5:00 PM on Wednesday, October 1, 2008. 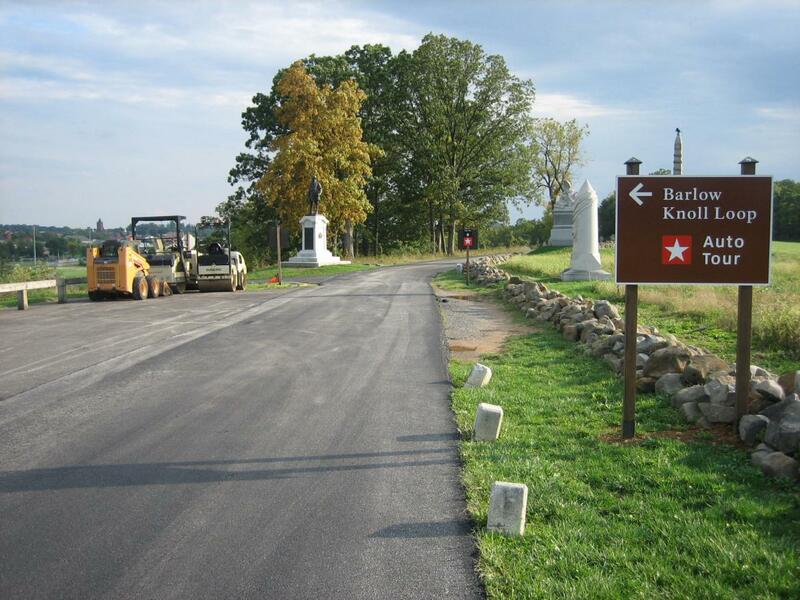 By the way, our flank markers on Reynolds Avenue haven’t been covered yet with the dirt and gravel mix. This view was taken from the north facing south at approximately 5:00 PM on Wednesday, October 1, 2008.